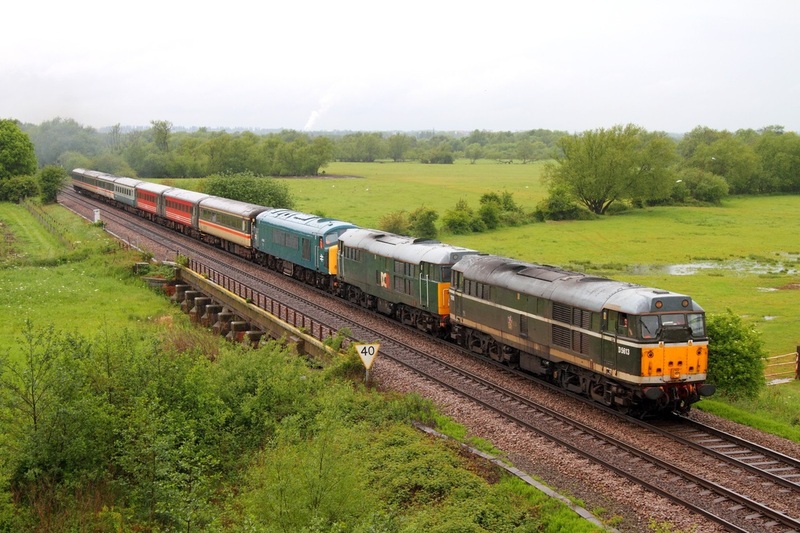 Br Green 31190 leads DCR 31601, Br Blue 45133 on the 5Z45 Chaddesden Sidings to Dereham at Syston on the 24th May 2014. 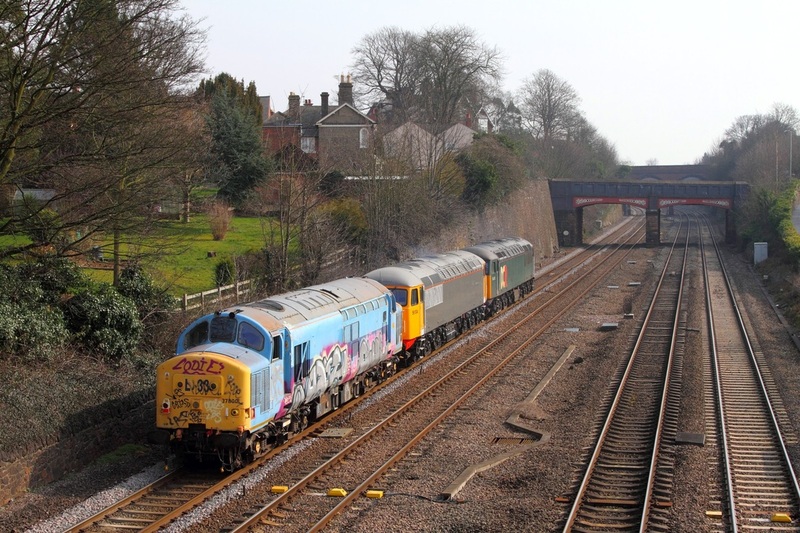 Riviera Trains liveried 47843 'Vulcan' leads Network Rail liveried 57312 'Peter Henderson' on the 6K50 Toton yard to Crewe Basford Hall engineers at Barrow upon Trent on the 28th March 2014. 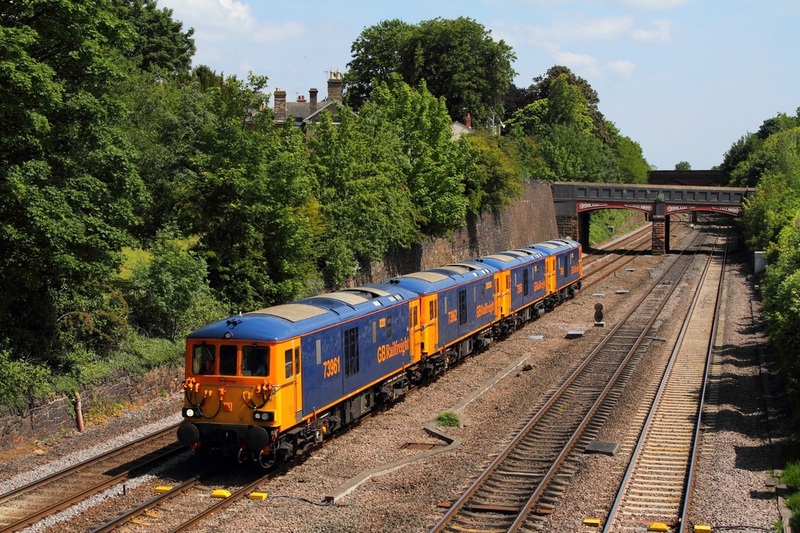 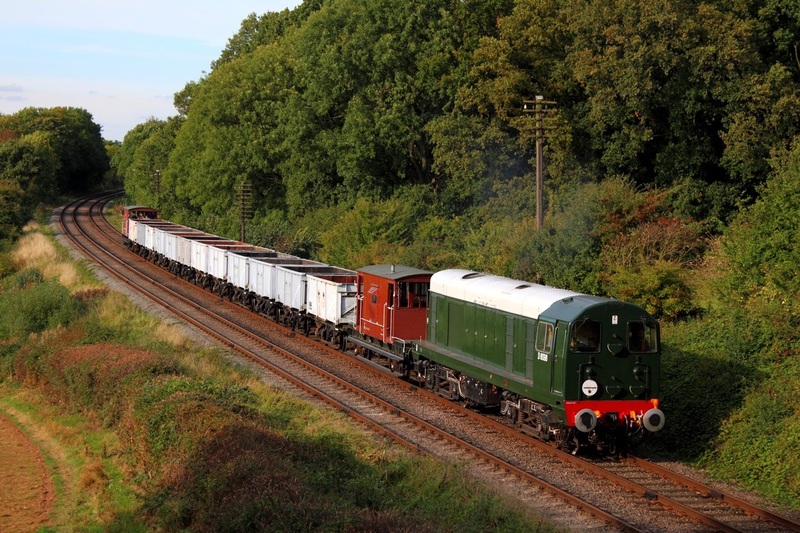 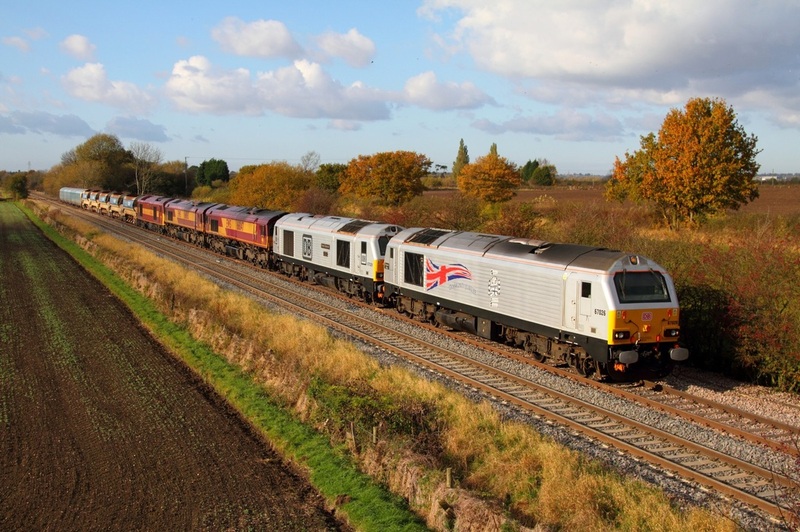 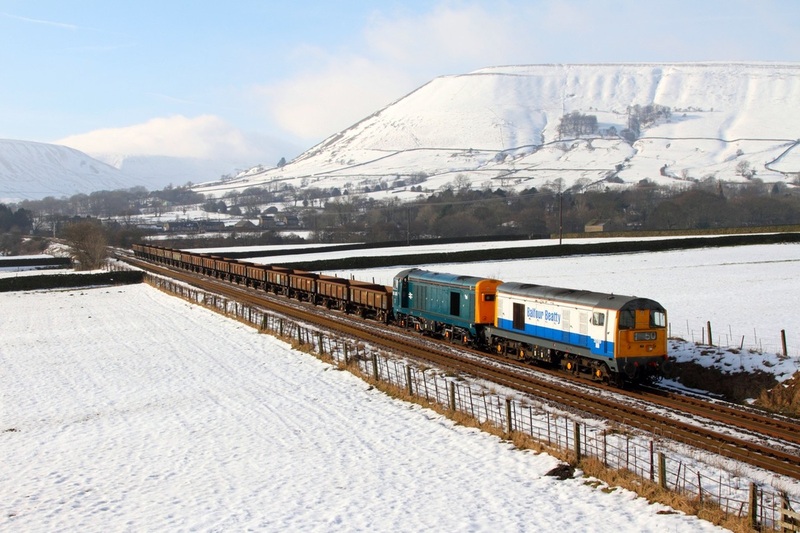 Both locomotives are currently on hire to GB Railfreight. 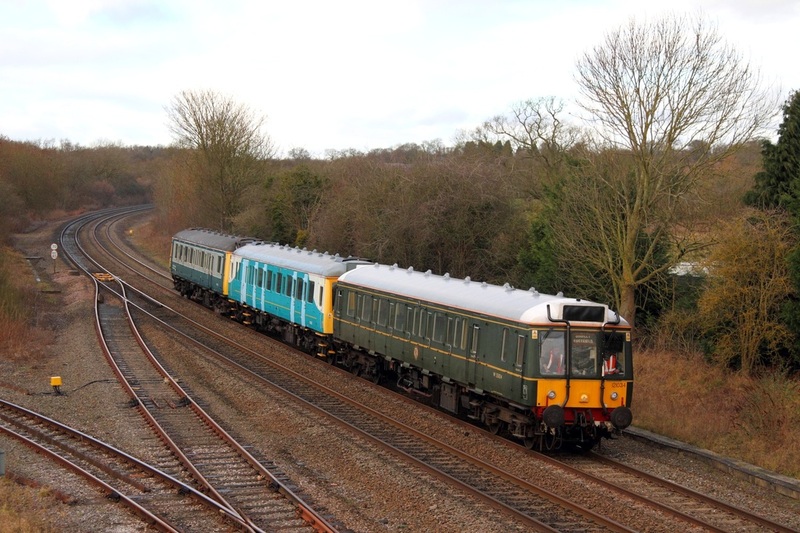 Br Two Tone Green D1705 on the 1X33 15:10 Loughborough to Swithland TPO service at Woodthorpe on the 29th March 2014. 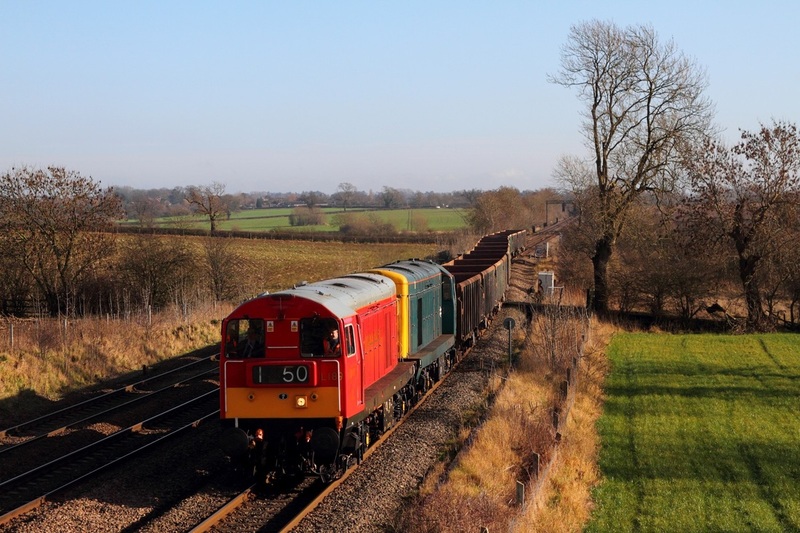 20142 tnt 20189 on the 6Z20 Maltby Colliery to Chaddesden sidings at Duffield on the 30th March 2014. 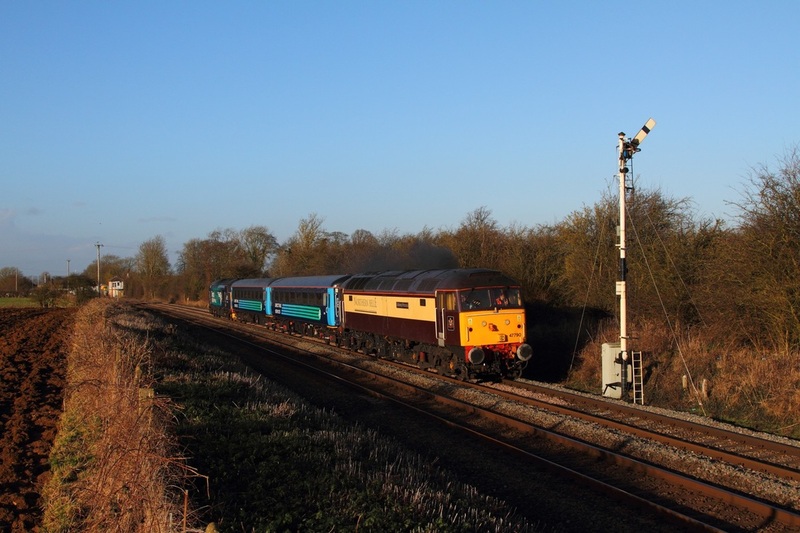 60066 leads the 6Z55 Toton North Yard to Kingsbury scrap yard at Sawley on the 4th December 2013. 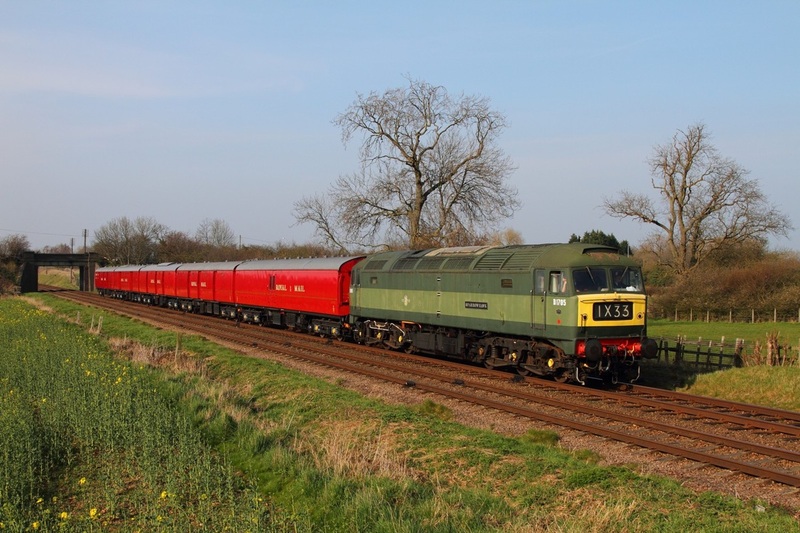 Direct Rail Services Northern Belle coloured class '57/3' no. 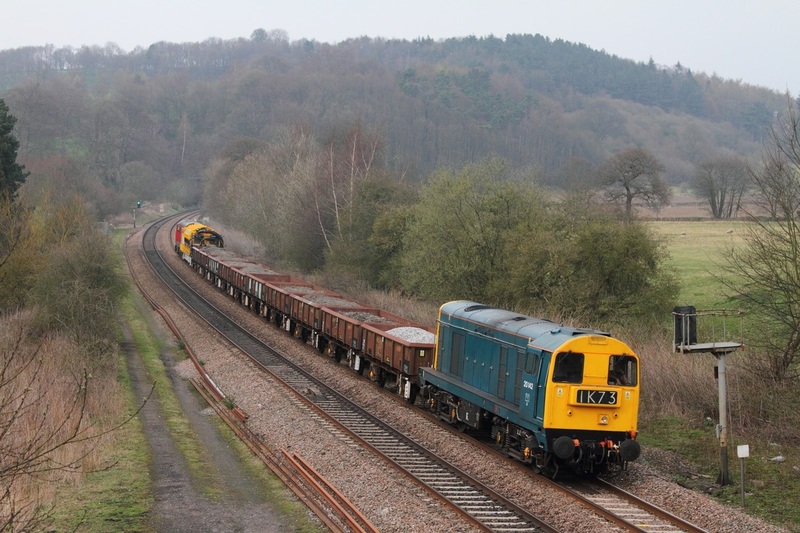 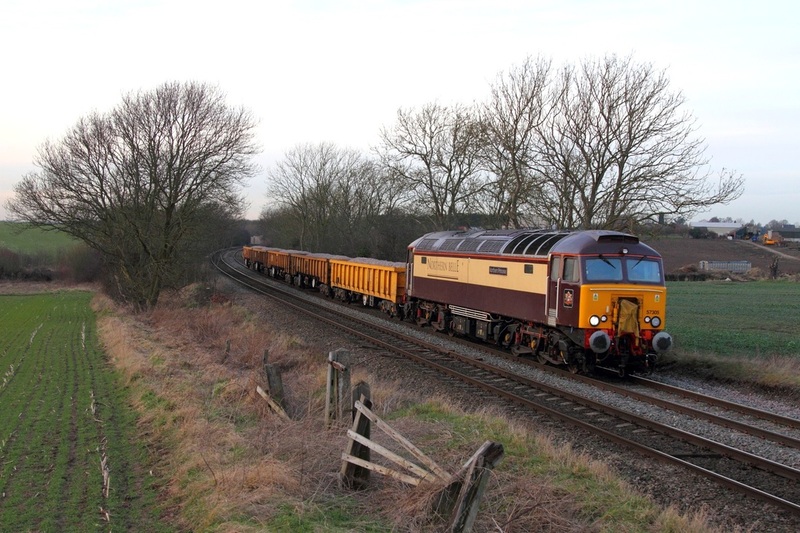 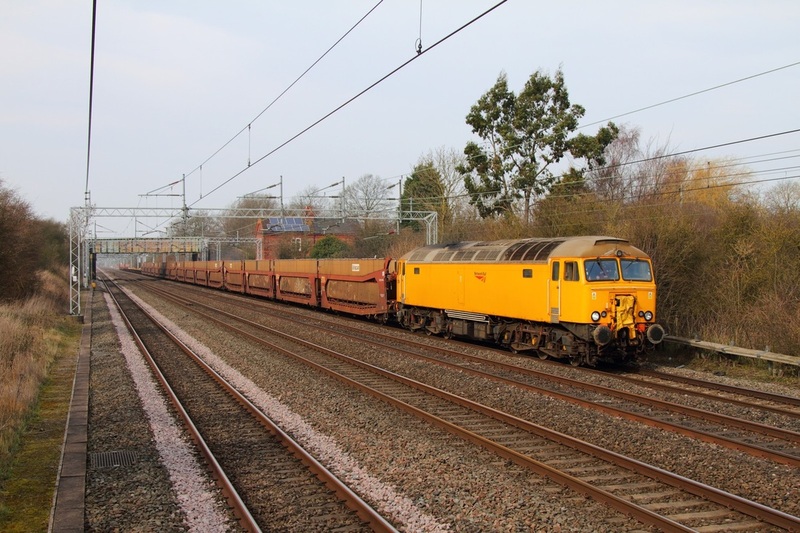 57305 worked the 6Z96 Crewe Basford Hall to Toton yard civil engineers at Chellaston east of Stenson junction on the 2nd February 2015. 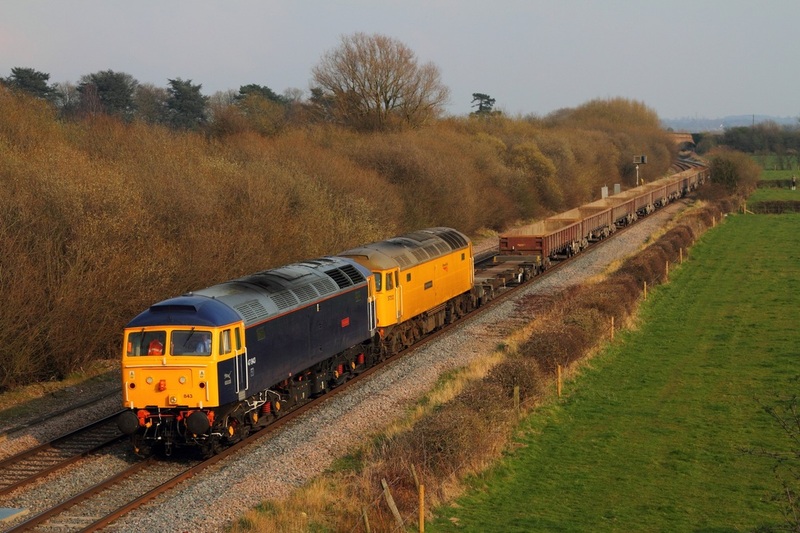 West Coast Railway's liveried 37706 hauls Chiltern DVT 82302 at Narborough on the 5Z47 London Wembley to Loughborough Brush on the 24th March 2015. 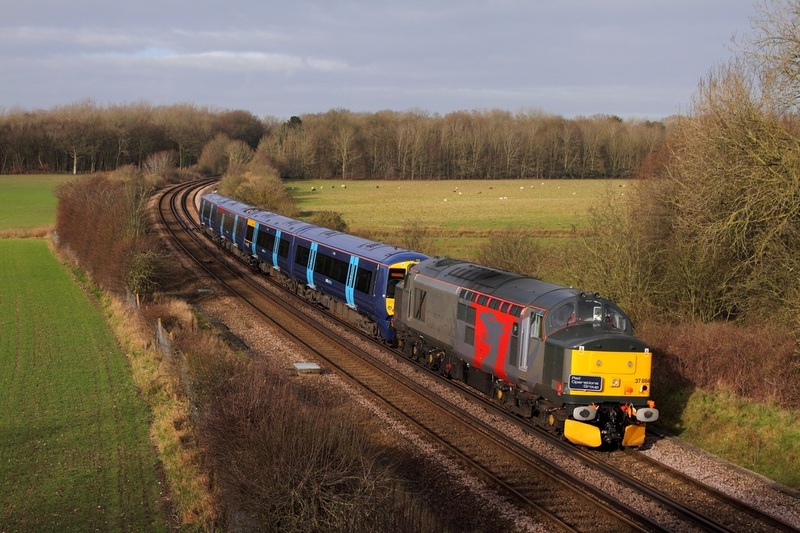 Just over a year since 50007 made its debut and successful return to the mainline on the Boston Docks working. 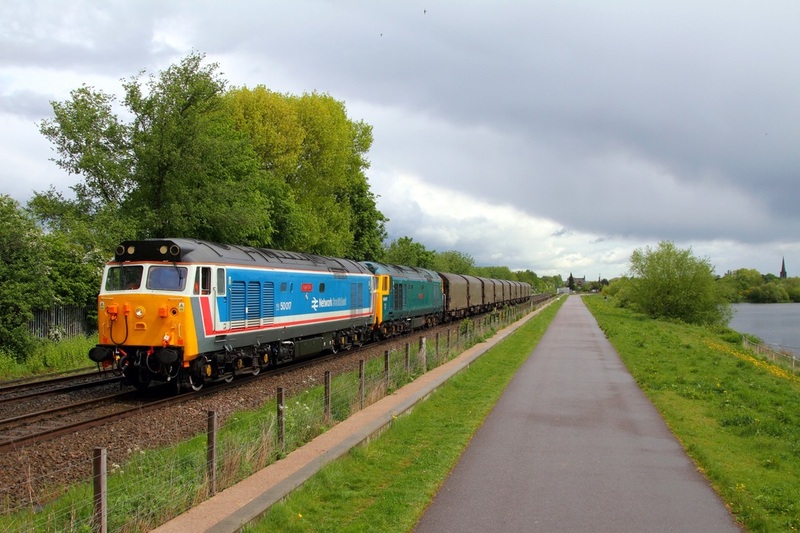 On the 19th May 2015, Network South East liveried 50017 leads Br Blue 50007 on the 6Z08 Boston Docks to Washwood Heath loaded steel at Attenborough nature reserve. 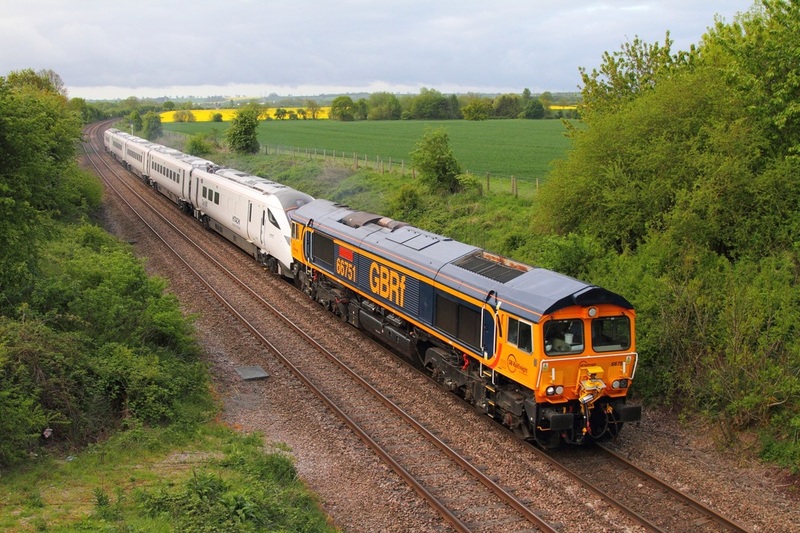 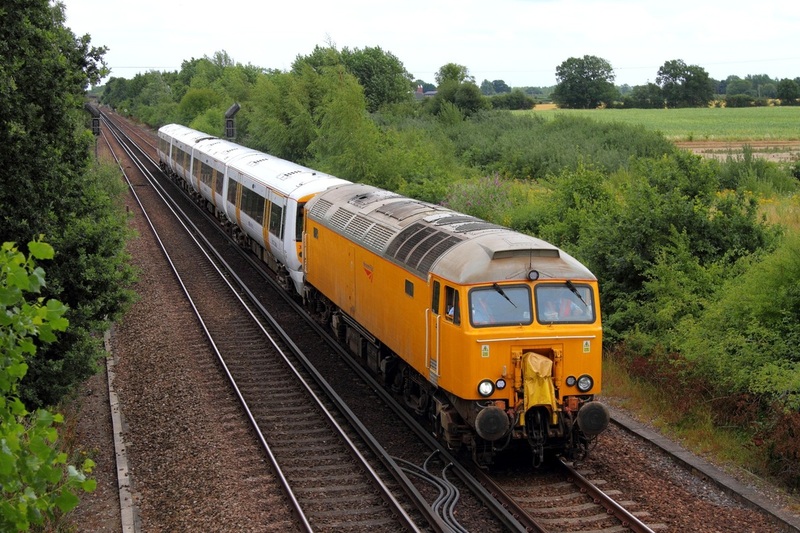 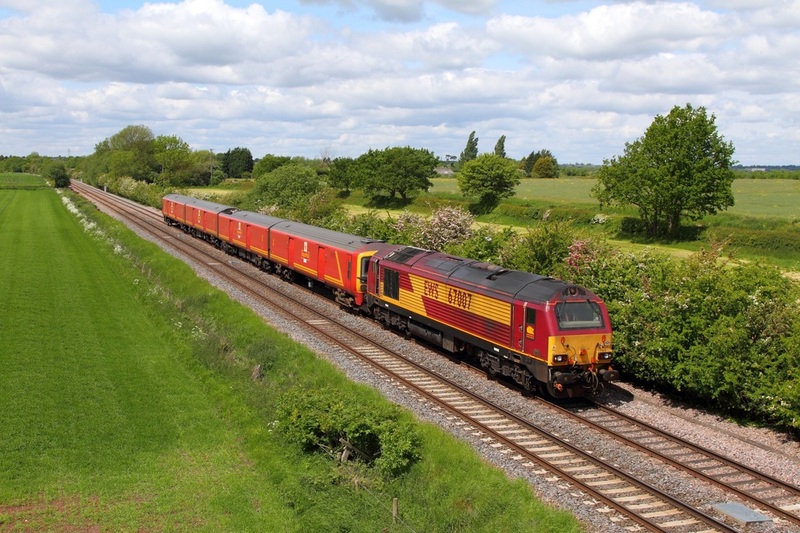 GBRf 66751 hauls IEP 800001 on the 5M98 Tallington to Old Dalby at Ashwell just north of Langham on the 16th May 2015. 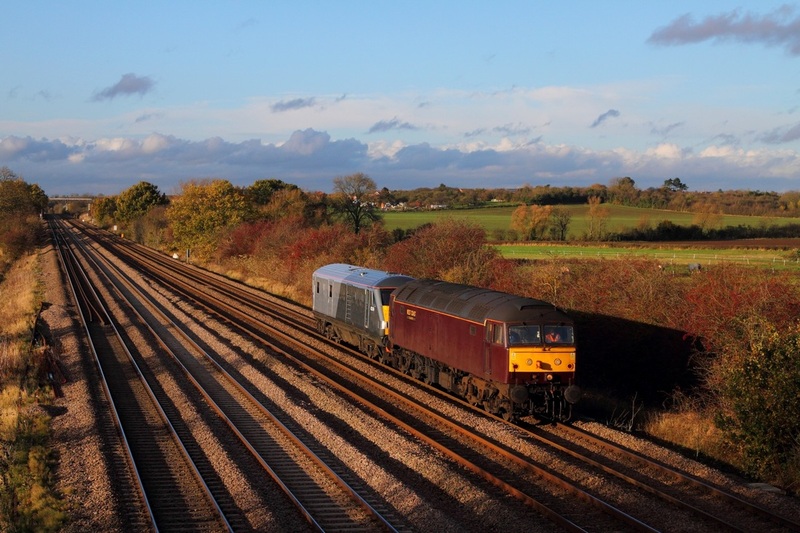 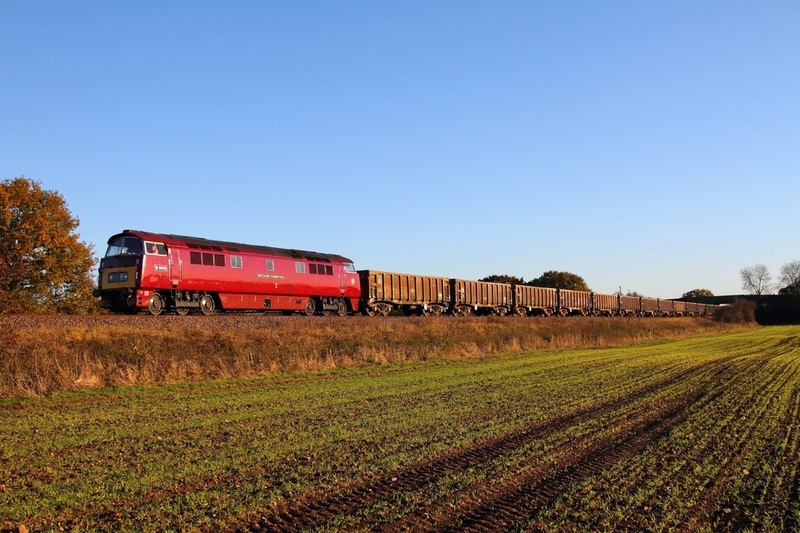 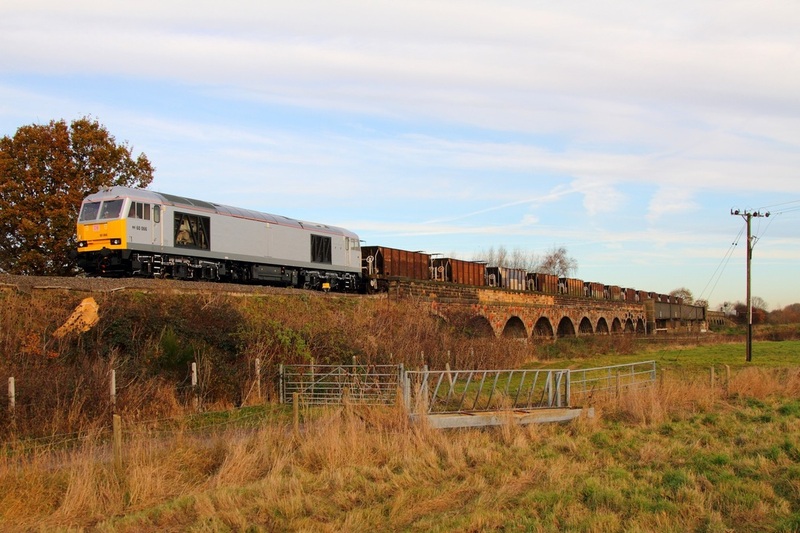 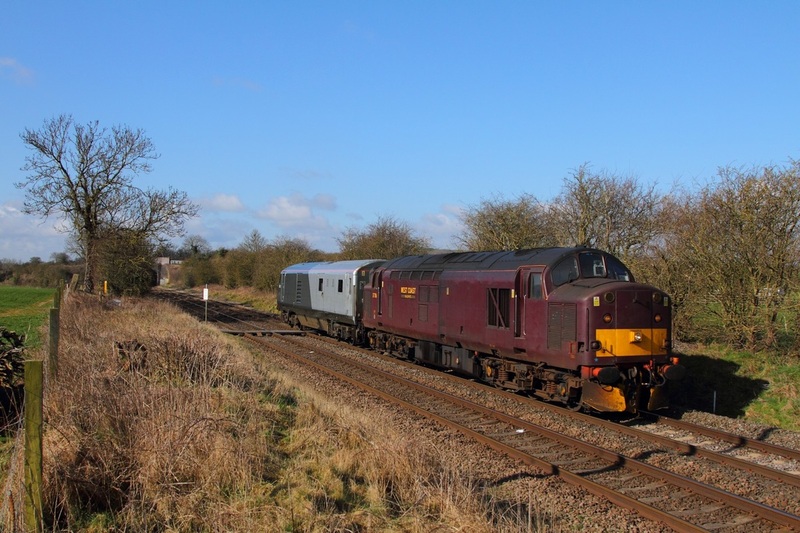 West Coast Railway's 47237 hauls Chiltern Railway's DVT 82309 as the 5Z33 1415 Loughborough Brush Works to Wembley at Cossington south of Sileby on the 12th November 2014. 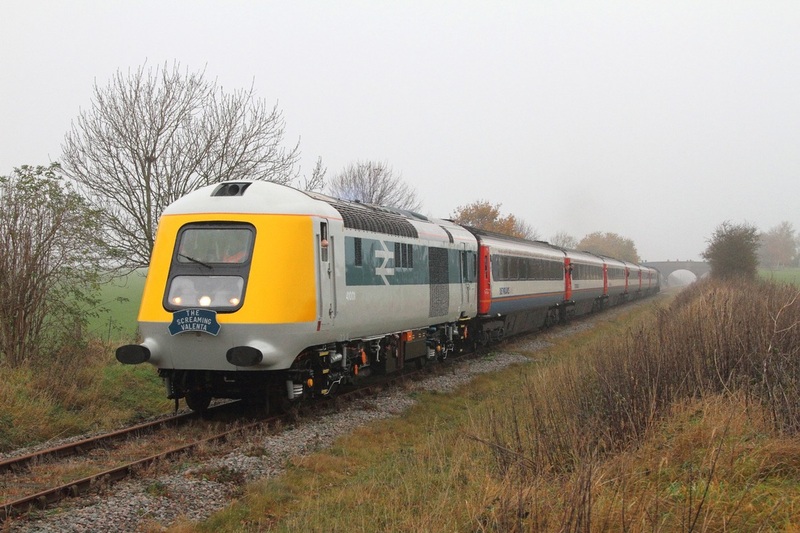 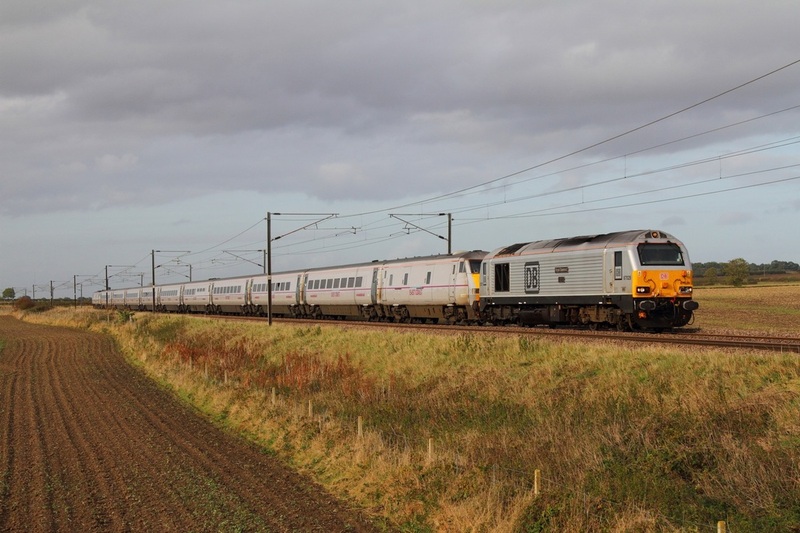 The 125 Group's Prototype power car 41001 after 38 years, made its preservation debut on the Great Central North Railway on the 15th November 2014. 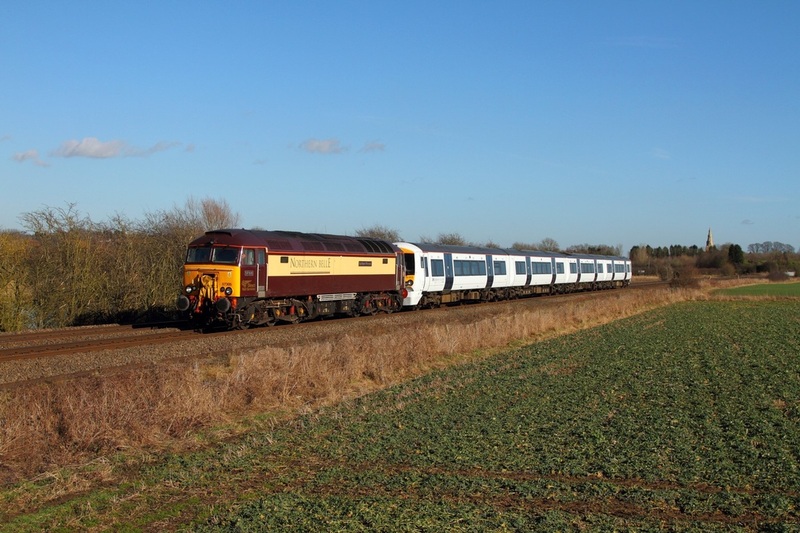 The Prototype Paxman Valenta engined power car is captured south of the Ruddington triangle hauling the 1320 Ruddington to Loughborough North service, its first passenger working in preservation. 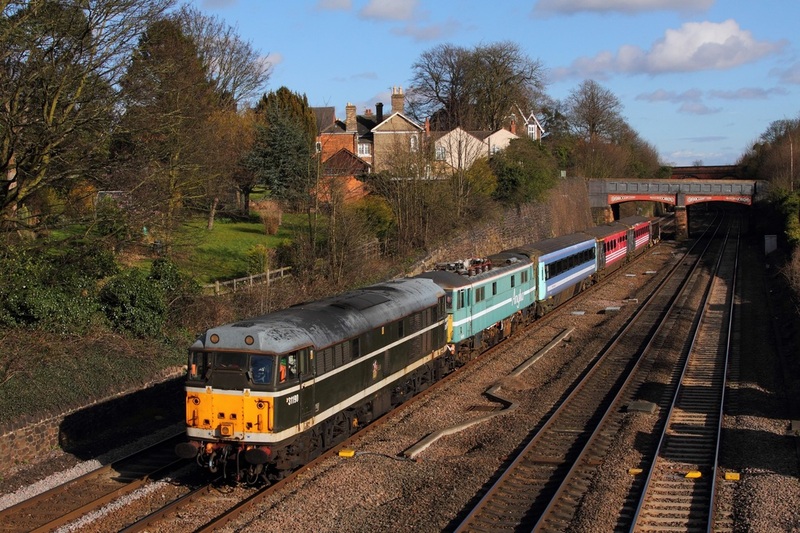 43045 and 43054 worked the 1Z25 1025 Derby to Hotchley Hill (forward to Ruddington) and 1Z26 return. 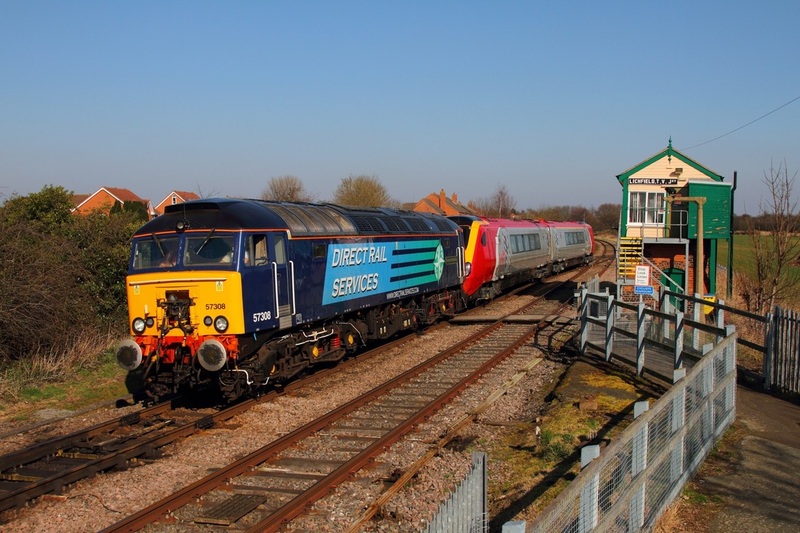 41001 replaced 43045 at Ruddington and worked with 43054 to Loughborough north and return. 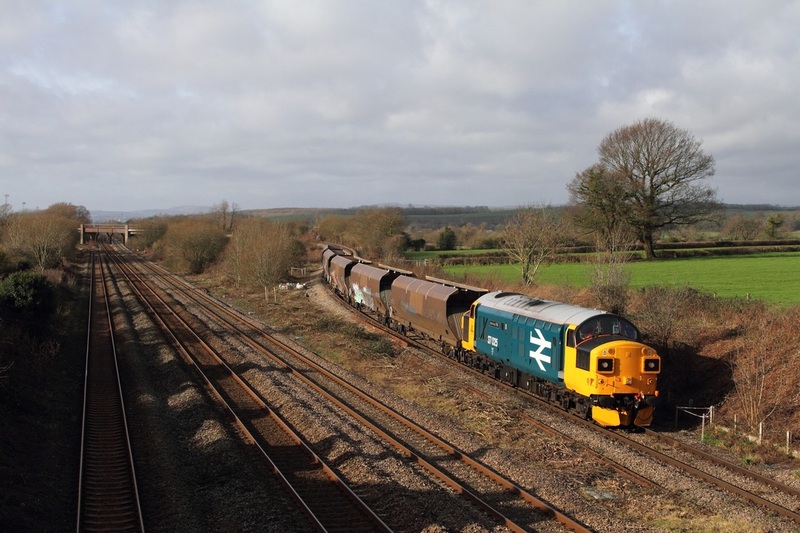 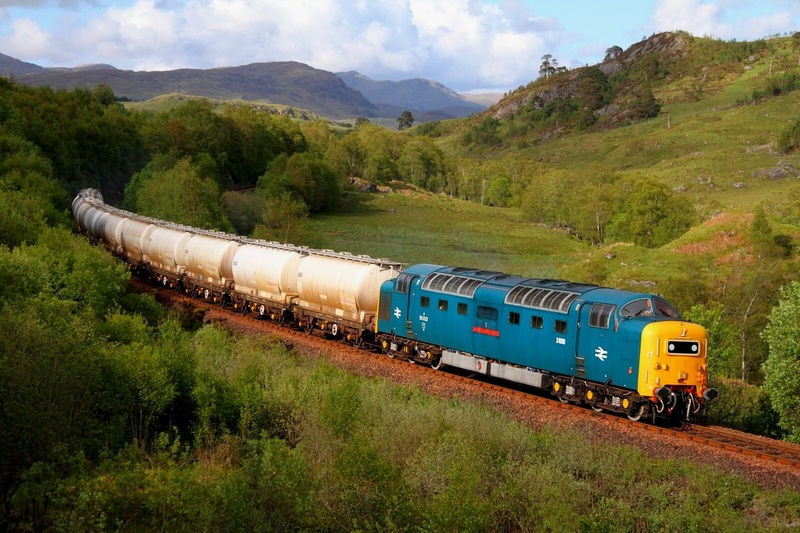 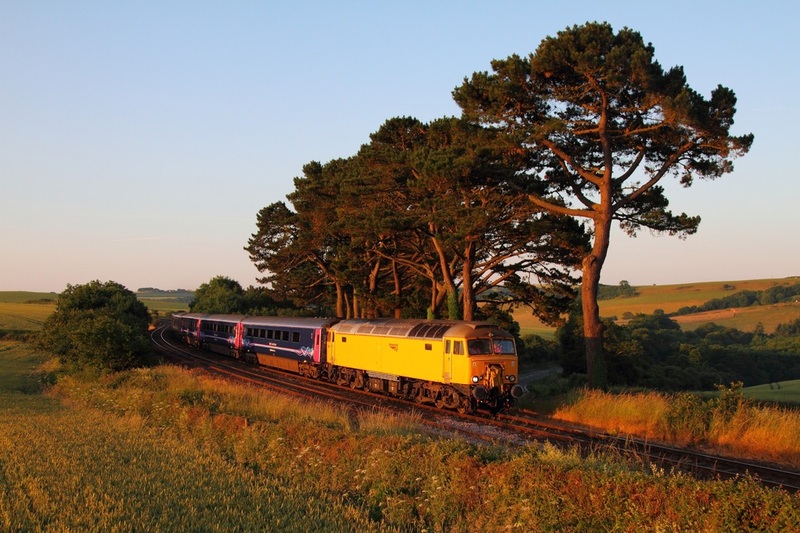 Huge congratulations to Project Miller for this remarkable and successful restoration of 41001.